If you're considering what it takes to fix your Porsche power steering then this is a good place to start. Its a very good idea that you do some research because this little job is easily and often underestimated. I know this because I've made every mistake possible and am therefore somewhat qualified to warn you of the many pitfalls. The information on this page is NOT complete - I do not have re-assembly instructions. Those would require many more hours of work than I have to offer. Still, you can get a good idea of what is involved by reading through the disassembly areas that I have here. At the outset, I should tell you that resealing a rack will be somewhere between moderately difficult and I'm-so-pissed-at-this-I'll-just-get-rid-of-the-car. I'm tempted to tell you it is sooo easy and that all you need is a little determination but I'm afraid this casual confidence will get a few of you in over your head and if that happens you'll be looking to lure me into a dark alley. Please review these "Ten Things to Know ... " before you begin stalking me. 1) It is moderately difficult to get the rack out of the car and this provides potential for a fair amount of exasperation (and it's even worse on the turbos). Even if things go very well, it will take over an hour just for removal. Another hour (plus) to get the rack re-installed. Expect to double this time if you haven't done it before. 2) Unless you have a hydraulic test stand, you'll have to re-install the rack in order to test for leaks and to make sure the rack works. If problems arise, you may have to remove it a second time to correct. This sucketh greatly. 3) Its possible that once you get the rack dis-assembled, you will find that you need parts, not all parts are included in the reseal kits. In fact, the one part that is most easily broken (during dis-assembly) is not included in the kit at all. ZF, (a German company with a long name) makes the rack and pump for our cars. They do not make the reseal kits. The kits are made by a company in Indiana. Their catalog is available on the internet, see www.transtec.com but to order, you will need to call them. Its best to order from them directly as re-sellers often re-package the kits to conveniently hide the fact that kits contain orings that are well past their shelf life. Kits packaged by Transtec are dated. ZF will not deal with anyone other than Porsche dealers for mini-parts. This means that your source for parts is very limited. 4) The new seals are delicate and can be easily damaged during installation, ordering replacements will postpone re-assembly. 5) Some tools are needed, a clean place to work, a way to clean up the rack and parts, some sort of vice, and a variety of sockets, extensions and tools to replace the seals. 6) Some machine work is needed to polish the main shaft. If the main shaft is not defect free, your reseal will probably last about a month. 7) It is easy to make mistakes in inspecting/reassembling the rack. Mistakes cost time and money. 8) There is a chance that you will need to have the steering re-aligned after reinstalling the rack. There is a very good chance that your steering wheel will not be centered and will require an additional adjustment. 9) With so many law suits over the past few years, it is difficult to find people willing to refit hydraulic hoses. Any parts purchased from the dealer will be very expensive. 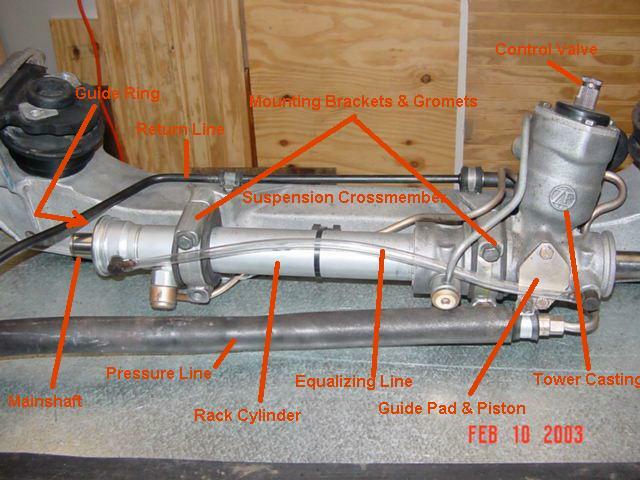 10) Steering racks are a relatively simple mechanism but one which relies on hydraulic pressure. Many "reseals" fail because problems with particulate contamination are not corrected. This is one reason that even most professionally rebuilt racks are warranted for only 12 months. Late Note: One exception: Autozone now sells a rebuilt unit that is warranted for life. This (above) is likely to be what you first see when you begin looking for the source of your hydraulic fluid leak. The fluid will probably be coming from one or both of the boots and may also be coming from the small hole in the picture. The hole should have a rubber or plastic dust plug in it (the plug is only intended to keep dust out, not to keep fluid in). Normally, there should not be fluid in this cavity. This hole is here so that when an alignment of the steering is done, the mechanic can visually confirm that the rack is centered. In the hole you can see a small dimple (almost hidden by shadow), the dimple indicates the rack center point (wheels should be straight ahead). At the very minimum, the rack and all of its' components should be completely disassembled, cleaned and inspected prior to re-assembly. It is likely that the inspection will reveal smaller problems that contributed to the seal failure. These should be dealt with. Aside from leaks, there are other ways the rack can fail. The most likely is a groaning that occurs when you first begin to turn the steering wheel. Groaning can also be caused in two ways; one, by air in the system (which is usually associated with a leak in the lines leading to the rack) or a bad seal in the control tower casting. Place the car on jack stands (front only) or ramps. Mark the outer tie rod ends (a touch of spray paint). Pull back the rack boots from the rack (careful, they may be full of fluid). 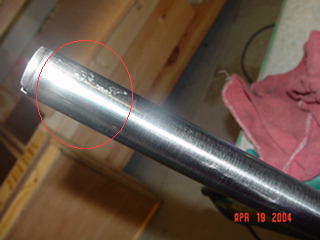 Inspect the exposed portion of the main shaft - this will give you a first indication of a worn or damaged shaft. 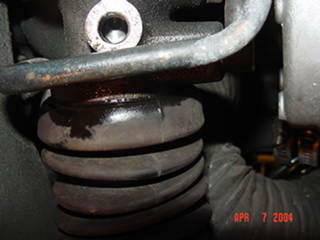 Disconnect the outer tie rod ends (use 2 wrenches to loosen jam nut and then turn the inner tie rod until the rod separates). Be careful to leave the jam nuts as undisturbed as possible so to help with minimize mis-adustments to toe-in. 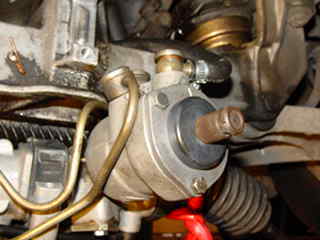 Remove the alternator (OK to leave wiring attached, but get it clear of its normal location ). Remove steering shaft coupler bolt. (Use a chisel to slightly open up the coupler - careful, the racks control valve is absorbing the blows). 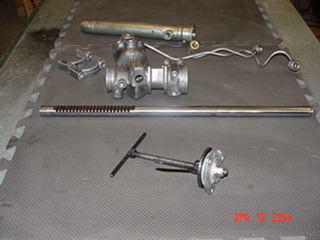 Mark the splined rack shaft (so that the steering wheel can be correctly re-oriented during installation). Disconnect the pressure line from the pump & drain. 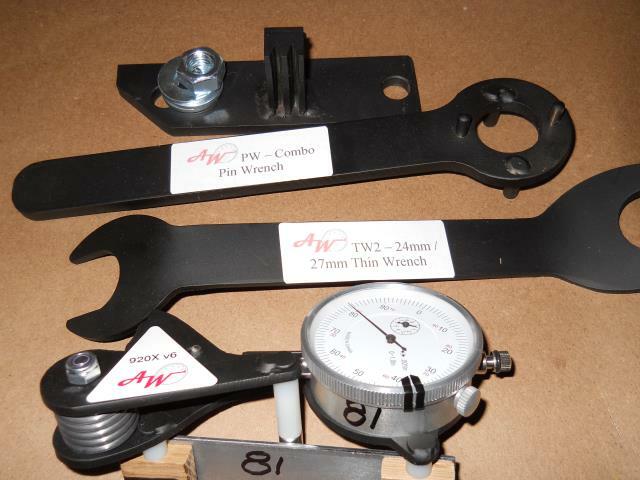 Loosen the 4 rack mounting bolts (one cannot be completely separated due to interference from the pressure line). 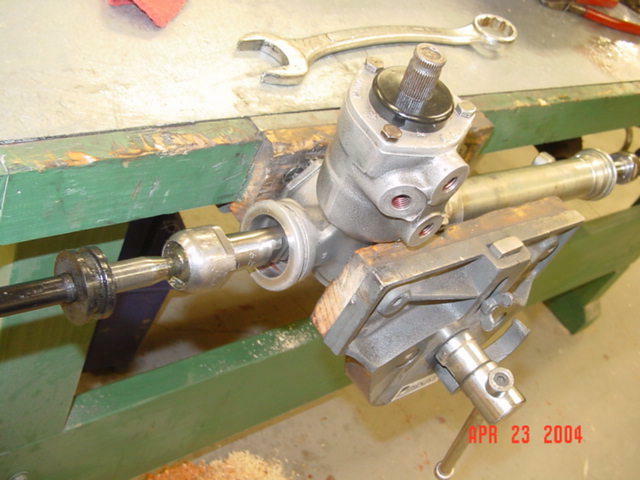 Separate the steering shaft coupler from the splined rack shaft. Disconnect the return line from its rack fitting. Lift the rack clear of the suspension cross-member and other obstructions and begin long-rack dis-assembly. Remove the equalizing line (black plastic tubing and fittings - careful, fittings are brittle and do not usually come with "kits." Remove the mounting brackets and grommets. Remove the rubber pressure line and the other hard lines. Drain these. A pipe wrench is a crude tool but will remove the fitting bolts. Use it only as a last resort. 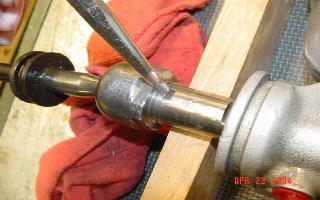 Remove the return line banjo bolt (aka hollow screw) and fitting, crush rings should be replaced.Note later models have a different fitting for the return line. 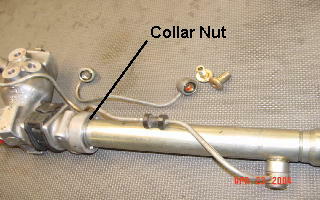 Place the rack in vice, (keep the jaws of the vice on the control tower casting and away from the pressure lines) and remove (2) the tie-rods (note: these are usually very tight; they have right-hand threads. There is a flange that may have been peened (hammered in such a way to prevent loosening). 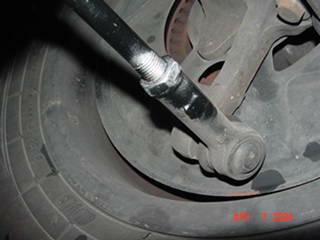 Filing or grinding of the flange may be needed to loosen the tie-rod. Set the boots aside and drain (if needed) and begin Rack Dis-assembly. Mark the tie rods (driver's side and passenger's side so you will know which goes to which side of the rack during re-assembly). 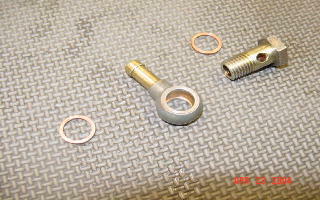 With the rack still in the vice, loosen the collar nut ( right hand threads). If you're using a hammer and a drift, take care not to damage the cylinder. Remove the rack from the vice. 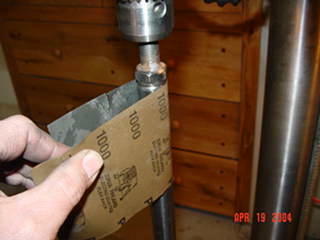 Using a small pick, gently remove the guide ring from the end of the cylinder. If you forget to remove the guide ring at this time, the ring will be damaged when the seal is driven out of the rack cylinder. Your ring will then look like the one above. 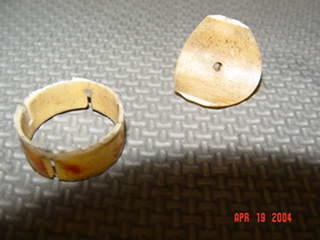 Note, the photo shows a damaged guide ring and the guide pad - both have a lot of dirt embedded and should be replaced. (These are NOT included in the "reseal kit." Reassembling the rack without the guide ring WILL cause premature failure of the seal. Mark the orientation of the splined shaft to the tower, getting it back in this orientation is critical to having a centered steering wheel. Remove the three 10 mm bolts from the top of the control tower and set it aside. Remove the control tower cover and seal. Grasp the splined end of the control valve and pull gently (while turning CCW) to remove the control valve & pinion assembly from the tower. 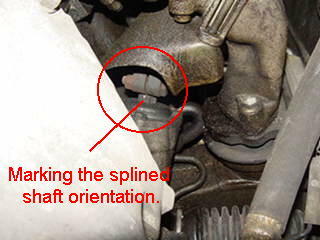 Photo shows the original orientation of bearings and shims. Remove the (2) 10mm bolts from the bottom of the control tower casting. Remove the small cover and hidden spring. Extract the guide pad piston, a special tool may be needed. Carefully remove the guide pad from the piston. Separate the main rack from the control tower. Remove the seal from the upper tower cover. Separate the shuttle assembly from the main rack shaft. Note the tool is the foreground is a seal puller - not absolutely required. Place the tower casting in a vice and observe the installation depth of the roller bearing cap. Gently drive the pinion bearing and cap out through the bottom of the tower. 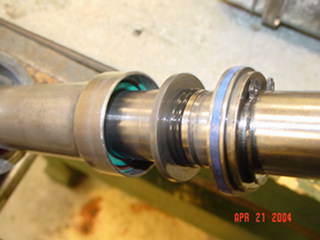 Set the bearing aside for cleaning/inspection. 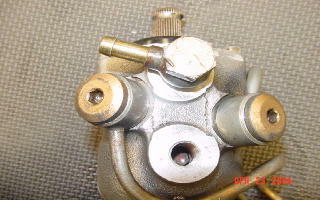 Turn the casting over in the vice and access the lower control valve seal via the pinion bearing hole. Drive the seal out through the top of the casting. Remove the small rubber plug from the centering pin hole. Remove the o-ring, nylon ring, & snap ring from the shuttle cylinder. Drive or press the seal out of the shuttle cylinder. 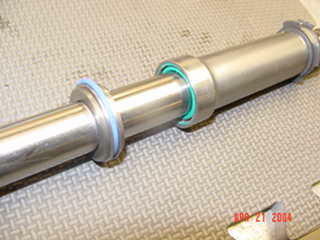 The seal will be "backed" by a bronze or nylon guide ring. Observe it's orientation, as one side is rounded and one side squared. Carefully, remove the snap rings, seal ring & o-rings. These pieces should be removed from the end away from the rack's teeth. Note how there is an o-ring under the blue seal ring (this is typical of all seal rings - they must be supported by an o-ring). Be careful when removing the snap rings - it cannot be allowed to scratch the shaft. The main-shaft is the most expensive part of the rack. Its' surface is critical to long seal life. 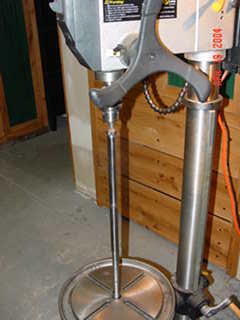 In almost all cases the shaft should be polished to return it to a scratch-free condition. Normally, pits cannot be polished out and will quickly destroy a seal. 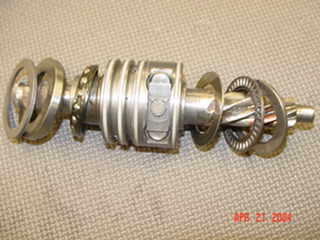 A skilled machinist can weld a pitted shaft andthen machine it back to original tolerances. Polishing is not something I would attempt by hand. Here, I have set up a drill press to rotate the shaft. I then simply use a wet or dry paper (1000 or 1500 grit) to wet-sand small scratches out of the shaft's surface, finish with either 2000 grit or buffing compound. A well equipped machinist can do a much better job for about $25. The above picture is taken from a flood damaged car - beware, this sort of thing is frequently sold on EBay. All metallic parts should be cleaned in a mild solvent (white gas or lacquer thinner). Plastic (nylon) parts should be cleaned with dish soap, (stronger solvents will make them brittle). Other cautions: Many of the fasteners and parts of the Porsche are cadmium covered as a form of corrosion control. We tend to want to clean everything perfectly and many of us have found that a wire wheel (mounted on a bench grinder) works well for this. For cadmium covered parts, this is an extremely bad idea. Cadmium is carcinogenic - it causes cancer. Beware, cadmium is a life altering substance and can EASILY get into your bloodstream where it will then damage your kidneys. Kidneys are extremely difficult to change.